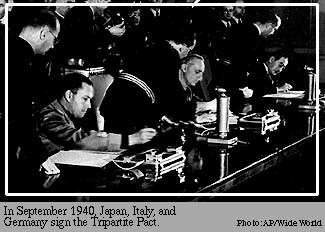 Also known as the Berlin Pact, the Tripartite Pact was signed by WWI enemies Germany, Italy and Japan on September 27, 1940. The thrust of the agreement was mutual assistance should any of the signers be attacked by any nation not already in the war. Within six months, Hungary, Romania, Bulgaria, and Slovakia signed, and when Yugoslavia chose not to sign, their country was invaded by Italy and Germany. 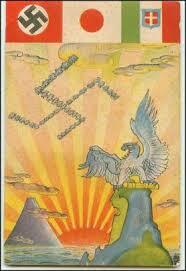 The resulting Italo-German client state of Croatia joined the Pact in June 1941. Primarily aimed at the United States, the Pact recognized two spheres of influence: Japan recognized “the leadership of Germany and Italy in the establishment of a new order in Europe,” and Japan “was granted dominance over Greater East Asia.” However, the Pact was somewhat limited due to the disparate goals of the signers. One result was that each signer was required to declare war on enemies of the Pact. Economic cooperation between signers was difficult at best. Japan would not grant economic concessions to Germany, and Italy received even less consideration in their agreement. In response to the alliance, Britain reopened the Burma Road with an eye to causing “inconvenience to Japan without ceasing to be polite.” The U.S. then made another loan to China and gave assurances to Chiang Kai-shek of American support. In June 1941 after the Axis powers invaded the Soviet Union, Finland entered the war as a “co-belligerent” in an effort to regain territory lost during the Winter War of 1939-1940. However, they never signed the Pact. Italy was the first Axis power to give up, surrendering in September, 1943. A year later, Bulgaria, Finland, and Romania surrendered, and by May, 1945, the Germans surrendered. Japan did not give up until August, thus bringing an end to the war. Talkshow Thursday: Meet Norma Gail!